After four years, SM The Ballad returns, this time with an expanded lineup. With TRAX’s Jay fulfilling military duties until later this year, Super Junior’s Kyuhyun apparently busy with musicals, and trainee Jino inexplicably MIA, the only remaining member of the original quartet is SHINee’s Jonghyun. 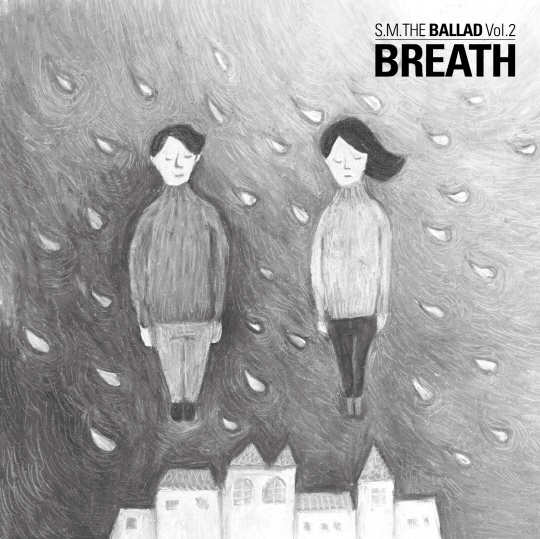 The artists joining him for their second album Breath are SNSD’s Taeyeon, EXO-M’s Chen, Super Junior-M’s Zhou Mi, Super Junior’s Yesung, f(x)’s Krystal, TVXQ’s Changmin, and soloist Zhang Li Yin. This time around SMTB is a series of duets and a few solos meant to highlight the vocal power and connection of all the artists involved. The album opens with “Dear” which serves as a beautiful intro, the strings both boding and melodious. It properly sets the stage for something captivating, something that will most likely sweep you off your feet, much like those scenes in movies where the two lovers are dancing in soft snow. Unfortunately, as soon as the mini starts in earnest, some of that magic is lost. While no one can ever deny Jonghyun’s explosive vocals, lead single “Breathe” is nothing new for him, nothing challenging, and certainly nothing that would allow listeners to grasp the full extent of his skill if they were coming to K-pop fresh. Teaming him up with Taeyeon was successful insofar as it allowed his vocals to shine. And while Taeyeon is a decent singer, there’s more to her range that is certainly not showcased here, and her presence doesn’t add any new dimensions to the sound previously established by the four original members. The actual vocal arrangement and composition are beautiful — in fact, musically it’s what you’d expect to follow such a sweeping intro — but once the vocals are laid on top, it just sort of fizzles more than it burns. Next up is Yesung’s solo, “Blind,” which does its job on the album, providing a lower register and grittier tone to counterpoint the boldness of Jonghyun’s high tenor. However, by itself it’s just another song on another drama soundtrack, and doesn’t leave us much of an impression. “Set Me Free” is also painfully underwhelming. I want to believe that there’s more substance to Taeyeon’s voice than what’s here, but all I hear is a delicate voice that has its moments of vibrancy. On the whole it is more or less what you’d expect from any female pop singer in the business — vocals that are decent, but that can sound dangerously close to cracking at moments. Using the album’s two strongest vocals on “A Day Without You” gave SMTB part deux its only real peek into the luster of its predecessor. Jonghyun and Chen’s voices work surprisingly well together. They don’t attempt to out-sing one another, something the original quartet was accused of. Instead they provide listeners a coherent, cohesive sound that isn’t overpowered by the surrounding music, but rather blends with it to give the album one of its two most unique tracks. “When I Was… When You Were” is a cute song. It’s somewhat reminiscent of Juniel’s collaboration with CN Blue’s Yong-hwa,“Babo” — spritely, youthful, and adorable enough to attract the sighing noona in all of us. However, vocally, there’s nothing much to grab onto. The vocals aren’t bad, just unimpressive. Krystal, as with Taeyeon, has that flowery, pretty voice that’ll sell records and attract younger fans, but there’s very little meat here, just a lot of confection. At the very least, what the song did was give Chen a chance to show what he’s capable of as a power vocalist. His lower register is commendable, and he’s got a decent amount of control over his tenor notes. Probably the most puzzling choice was to only make use of Changmin just once throughout the entire album, for the Japanese version of the lead single. Pairing him with Krystal suggests they were really mainly interested him for his Japanese skills, but even Krystal was given more airtime than the SM legend. You’d think that Changmin’s vocal range alone, which allows him to reach for notes most wouldn’t even try for, would have earned at least one other song on the album in his native tongue. The Japanese version of “Breathe” doesn’t really improve on anything Jonghyun and Taeyeon didn’t already accomplish in the original. But it would’ve been unthinkable to exclude the remaining members of the group that had arguably the biggest impact on Hallyu’s spread throughout Asia. His inclusion was therefore more or less a means to ensure TVXQ’s presence on the album. While Changmin only appears once, Yesung appears to sing both the Korean and Japanese versions of his solo. The Japanese version almost a carbon copy of the Korean version, so there’s nothing more to be said about it. Of the three versions of “Breathe,” the most interesting is the one sung in Chinese. At least in this version, both voices, male and female, are equally matched in strength. While Jonghyun and Changmin outshone Taeyeon and Krystal in their respective duets, Chen and one of the very few female power vocalists in SM’s stable, Zhang Li Yin, mesh well vocally. The watery smoothness of Mandarin also adds to the grandness of the song, something composers were probably aiming for in the Korean version but didn’t quite reach. To round out the album, Zhou Mi tackled the Chinese version of “Blind.” He has a big voice, but here it’s sadly one-note. It’s not anything particularly different or more inspiring than any other male singer in SMTB, which speaks more to the lineup of this current permutation of the group than to Zhou Mi’s actual vocal talent. Unfortunately, except for Zhang Li Yin, the inclusion of female voices in this highly anticipated comeback didn’t spark much inspiration. The composers and writers seemed unsure of how to best take advantage of the female presence, so they opted for overdramatic power ballad arrangements reminiscent of background music for romantic comedies, drowning out the wispy vocals better suited for a thinner pop sound. If these are supposed to represent the strongest voices SM has, then there’s apparently an alarming lack of raw female vocalists at their disposal. It makes one wonder whatever happened to groups like The Grace, the closest thing to a power vocal girl group SM ever managed to assemble. Instead of making a group composed of the vocally strongest members, SM went for the all-group grab bag and hoped for the best. What’s sad is SMTB has been diluted from the harder R&B edge it was to the K-drama OST style ballads that are more commonplace. Though there isn’t anything particularly out of order about using a popular style of composition to garner more attention, it’s unfortunate that some of the passion and raw vocalization heard in the first permutation of SM’s experimental vocal group is missing. What’s blatantly apparent is that this album wasn’t so much meant to really highlight vocals. It was more aimed at trying to find the best combination to attract a variety of fans. SM utilizing vocalists from all their active groups indicates that they were hoping to cash in on one or more of the ballad group members’ popularity to garner attention. That “throw them against a wall and see which one sticks” mentality sadly makes this album very one-dimensional, giving listeners miniscule sparks of the versatility and vocal power of the original lineup. You From Another Star: Episodes 16 & 17, the Cute is Back!